The Weald of Kent Golf Course & Hotel overlooks the 9th green of the golf course and is situated just 100 meters from the main clubhouse. It’s an ideal location for residential conferences, golf breaks or if you need a hotel in Kent as a base convenient for Maidstone, Ashford and the surrounding villages. 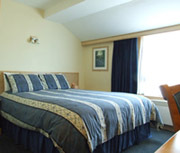 The hotel sits in an idyllic, quiet setting and is perfect for anyone looking for a clean, modern and affordable hotel room in Kent.